These butternut black bean burgers are BOMB. Say hello to your new favorite veggie burger! 1/2 tsp dried parsley or fresh if you have it! 4 burger buns I used a bakery poppy seed onion bun - amazing! Whisk together 1 TBSP ground flax with 3 TBSP water and pop it in the fridge to set. Next mash black beans in a large bowl and set aside. Alternatively you can use refried black beans, I've made it both ways! Measure to ensure you have a cup and you're good to go. Add your butternut squash to the beans and set aside. Next saute onion, celery, and garlic in olive oil until tender and near-translucent, adding the minced garlic towards the end to prevent burning. Season the veggies with your Italian seasoning blend, salt, cayenne pepper, garlic powder, and parsley and stir to coat. Add the freshly sauteed veggies to your beans and squash and stir in your oats. Remove your flax egg from the fridge and add it to the bowl. Stir to fully incorporate and roll mixture into four balls. For optimal burger shape, cup each ball in your hands and squeeze tightly, rotating as you gently, but firmly, press it into a disc. Giggles aside, pop your burgers onto a plate, cover with foil or cling wrap and refrigerate as you prep your buns [or lettuce wraps!] and toppings. This will give them a little while to set. You can even leave them overnight and cook them up the following day. I often make one after 15-30 minutes of chill time and cook up the rest the following day. Pour a tablespoon or two of oil in a skillet and heat to medium-high, so the burgers sizzle when you add them to the pan! Cook for a few minutes on each side until you're left with a golden crust. and a warm center. Repeat for each burger, or cook two at once if you have a big enough pan! I'd skip crowding all four together just because they're a pain to flip when all up in eachother's business. A tip for perfectly shaped veggie burgers? While sizzling away in the skillet, I use my spatula to gently help form the sides into a perfect disc. Works like a charm! Slather your buns with sriracha mayo, pile them high with lettuce, spinach, pepper jack and top each with a yummy butternut burger. Enjoy! * Feel free to use canned butternut puree or simply roast/cook your squash and mash away! The burger itself is naturally vegetarian, vegan, and gluten-free, so choose your favorite toppings and have fun with it! Vegan mayo combined with sriracha makes a great veganized version of the sauce I used and a fresh mountain of guac also makes another stellar vegan topping! Following a gluten-free diet? Make sure you grab GF-certified oats! You can also use your favorite GF bun, wrap the burgers in lettuce, or top them on your favorite salad! It's awesome any which way! 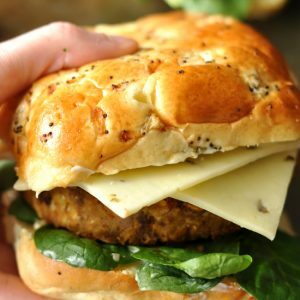 There are so many possibilities for these tasty veggie burgers, I hope you love them as much as we do! Most weekends I'll cube and roast an entire butternut squash and use it for soups, salads, and even these burgers! You can puree roasted butternut squash at home for this recipe or opt for a store bought puree, totally up to you!